A custom rig for a discerning customer. Dual Back Carry Trekker style sheaths with snaps. A custom sheath, firesteel, and firesteel loop for a Survival Magazine shoot. A private label flag for Eagles and Angels. Field Notes cover seen on the streets of Paris. Maxiumus wearing his new custom collar. A hand carved maple spike for a dragon scale barrette. A Custom Journal Cover for the Zombies Run! Franchise. Fully lined and fits a Moleskine journal insert. Some customers can’t get enough of our dragon scales and custom thread colors. A custom Dice Tray and Dice Bag for gaming customer. A walnut and antler handle made with red and white spacers for a carving knife. A dontation bag for Dragon Fall (Convention) and thier fund raiser. A compass rose carving on a guitar strap. A close up on the four pocket pen holder. A pair of dicebags for One Stop Co-Op shop. 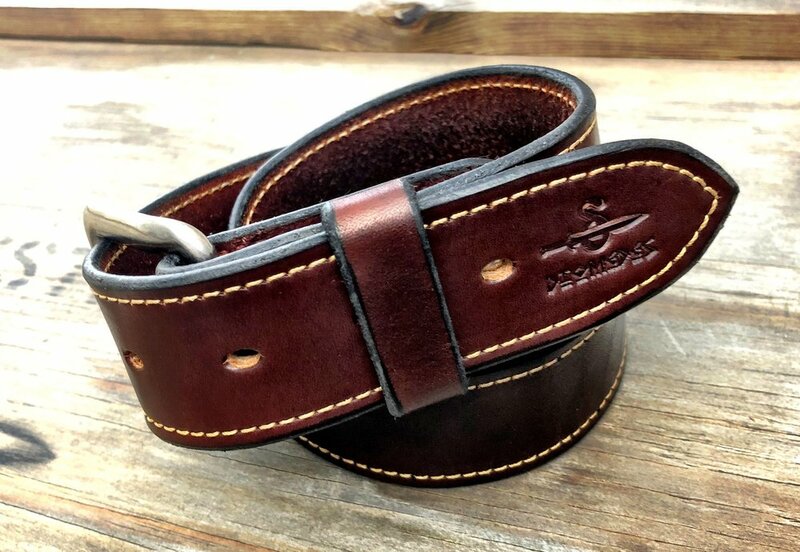 A custom guitar strap for a guitarist in Williamburg, VA.
A hand stitched blue dress belt for an Archivist in D.C.
A custom journal for Nicole Apelian. A birchbark and hemp twine match case with maple top and bottom. 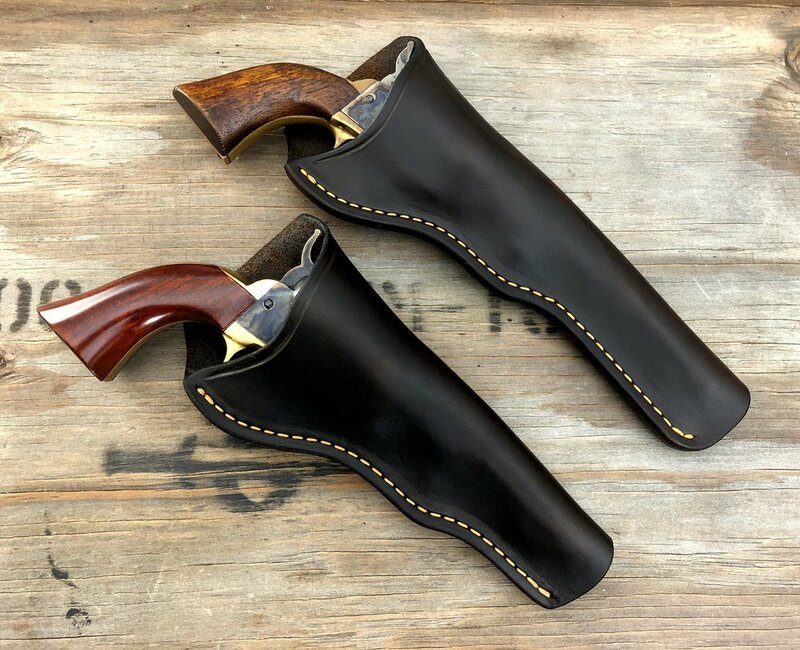 A pair of Carlos Border sheaths for a pair of Fiddleback Blades. A refurbished hatchet and mask. The first PPS prototypes to come off the bench. A refurbished pipe hawk with a mask, collar, and dangler. A custom Camptain America Shield Sheath. A set of customer holsters for the set of Harriet. 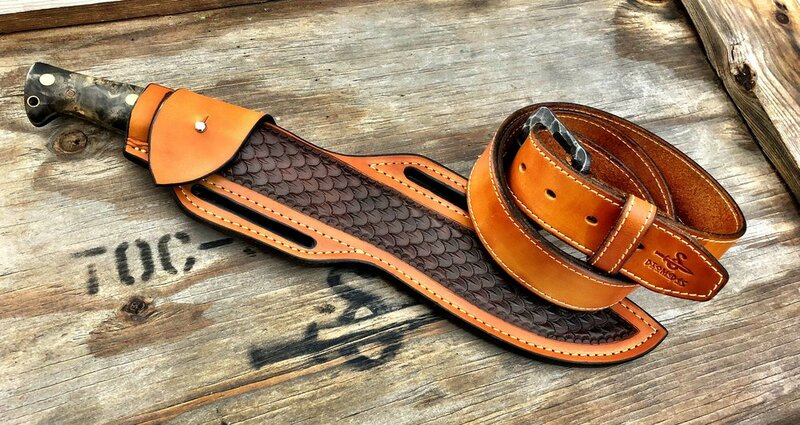 A custom Sheath for Britt Nance of Alone.